Taking the basic premise of my previous post one step further, this billboard is a good example of doing business in the “wholly new operating environment” that overlaps the formal and informal (prepaid) economy. As our taxi driver explained, he preferred not to keep large sums on him at the end of the day and put the money away almost daily (unless it hadn’t been a particularly good day for business) into his mPesa or mKesho accounts. While he banked with Equity Bank, the timings of their branches rarely suited him but mPesa agents were always accessible. Similarly, customers might choose to pay him using this method if they didn’t happen to have cash money in their pocket but had an accumulated balance in their mPesa accounts. You could conceivably say that the service/handset combination was becoming more of a debit card in its usage pattern but with far greater flexibility in timing, frequency and amounts of deposit and withdrawal than a traditional bank issued version. 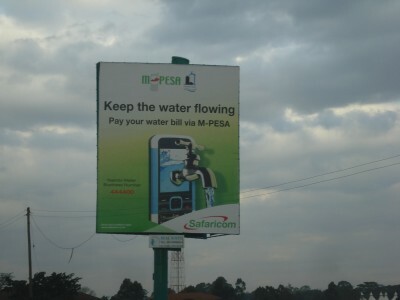 Now, even if you didn’t have a bank account or a regular paycheck, you could pay your periodic water bill if you had accumulated enough in your mPesa balance by the due date. This entry was posted in Business, Cross pollination, Design, Kenya, Platforms, Prepaid or informal economy, Research, Systems. Bookmark the permalink. Post a comment or leave a trackback: Trackback URL. Please do not copy and paste entire articles in other forums, in emails or research papers. A short selection and link is more appropriate. If you would like for others to read the blog, please link back to my blog. If you use a sentence or quote from my blog, please attribute the work to the original author, with a citation to this blog and the date of extraction. Isn’t marketing at the intersection of business and design? The views expressed are those of the author and do not reflect the official policy or position of Aalto University or Design Factory.